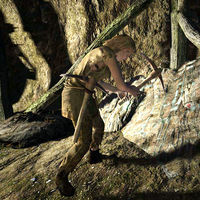 Bodil is a Nord miner who works under Beitild at Iron-Breaker Mine in Dawnstar. Like her colleague, Gjak, she never surfaces from the mine and spends her entire life working, relaxing, or eating. She wears a roughspun tunic and a pair of footwraps. She wields a pickaxe and carries lower-class loot and gold. Bodil appears to have a simple outlook on life and will say to you, "Here to dig. That's all." She seems content with her life, pointing out, "Dawnstar's got its problems, but as long as the ore is good, I'll stay." This page was last modified on 24 December 2017, at 03:37.